British saxophonist Ellie Parker is an active advocate of new music and creative collaboration. A first-year Da Camera Young Artist, Ms. Parker has recently performed at the NASA Biennial Conference in Cincinnati and Lubbock, TMEA 2016, Scandinavian Saxophone Festival, World Youth Wind Ensemble Project in Schladming, Austria and the Frederick L. Hemke Saxophone Institute. As a concert soloist she performed concertos with the Sam Houston State University Symphonic Band and the Claydon Chamber Orchestra. A frequent performer of chamber music, Ms. Parker has appeared with Space City Performing Arts and at the inaugural International Woodwind Duo Symposium at Sam Houston State University. In addition, she is a member of Element Duo, a saxophone duo whose debut album, Music by Living Composers, was released in 2015. She also performs with Aura, the University of Houston’s contemporary music ensemble, where she premieres new works for saxophone by Houston composers. 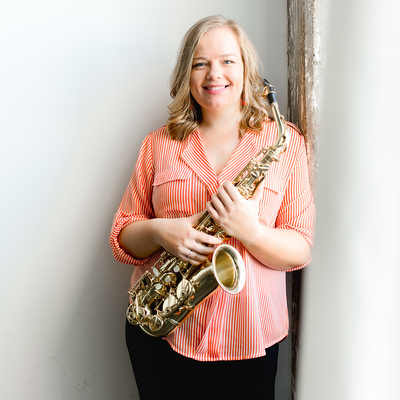 Ms. Parker is currently studying for a Doctor of Musical Arts in Saxophone Performance at the University of Houston, a student of Dan Gelok, where she also serves as a teaching assistant in Musicology. Prior to this, she studied at Birmingham Conservatoire with Naomi Sullivan, and completed a Master of Music degree at Sam Houston State University, where she studied with Masahito Sugihara. Ms. Parker has benefitted from additional study at the Koninklijk Conservatorium Brussel through the Eurasmus Exchange.